When it comes to making long-term profit through gambling, managing your betting bank correctly and finding the right staking plan is as important as identifying a winning strategy based on finding value in the market. Even if you have an edge and can identify value – which is where the bookies offer higher odds than you’d expect – you could still find yourself out of pocket with a depleted betting bank if your staking plan is not up to scratch. The Kelly Criterion – also known as Kelly Strategy or Kelly Staking Plan – takes elements from Fixed, Percentage and Progressive staking to create somewhat of a hybrid staking plan. It was developed in 1956 by John Larry Kelly Jr. to identify how to maximise the long term growth rate of investments and has since been used successfully by gamblers across a range of sports and games, as well as those looking to invest in the stock market. The Criterion looks at your current betting bank, the odds available and the edge you think you have in order to determine the optimal size of your bets. If you believe you have a significant edge on a particular bet, then your stake would be larger than a bet in which you only had a slight edge. For example, if you were and English Premiership fan betting on Tottenham to win at evens, you could place a 15% stake if you had a significant edge or a 5% stake if you had less of an edge, as calculated using the Kelly formula. There are a number of variations of the Kelly Criterion – some of which look much scarier than others – however the one that makes most sense to me is written below. This formula is based on bets with two outcomes – i.e. you either lose all of your stake, or your stake and profit are returned if you win – although several variations have emerged for different circumstances. Luckily, there are multiple Kelly calculators online which can take away some of the pain, particularly https://www.albionresearch.com/kelly/default.php and https://bettify.com/tools/kelly. A couple of points for consideration when using the formula. If you have a zero edge – i.e. your probability is the same as the bookies’ – then the Criterion states that you should not bet. Similarly, if you have a negative edge – i.e. your probability is lower than the bookies’ – then you could either avoid the bet or you could consider laying it. It is also recommended that you don’t bet more than the calculated Kelly stake as this is known to negatively affect your bank in the long term. 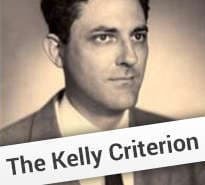 The main – and somewhat significant – flaw to the Kelly Criterion is that it assumes that you know the true probability of an event happening. Whereas this is easier to ascertain when flipping a coin, it becomes near on impossible to predict for a football game involving 22 players or a horserace with 10 runners. If you cannot be sure your probabilities are entirely accurate, then this could cause detrimental effects on your bank roll, particularly if you have a habit of overestimating the likelihood of winning rather than underestimating! Another drawback is that the percentage result from the Criterion is often a significant proportion of your bank balance, meaning that large stakes may be required. The Kelly Criterion aims to increase your betting bank at the optimal – or maximum – rate possible, which is a relatively aggressive approach. Most professional bettors would not risk anywhere near 10% of their bank on a single bet, whereas the Kelly formula rarely suggests low single digits. A common strategy employed by some gamblers to overcome the two issues above is to use a ½ Kelly or even a ¼ Kelly strategy to ensure they are not overexposed – this is simply halving or quartering the suggested Kelly stake. With problems associated with overestimating and predicting accurate probabilities, it is always sensible to be risk averse and bet less than the Kelly amount. Whether the Kelly Criterion is the right approach for you comes down to personal preference. It is sensible to approach your betting in a professional manner though, so concepts such as bank management and staking plans should be in your thinking. If it’s not using Kelly, then simple concepts related to the theory such as ensuring you research your bets, creating a betting bank separate to your other accounts and eliminating emotion from any betting decisions can significantly help.